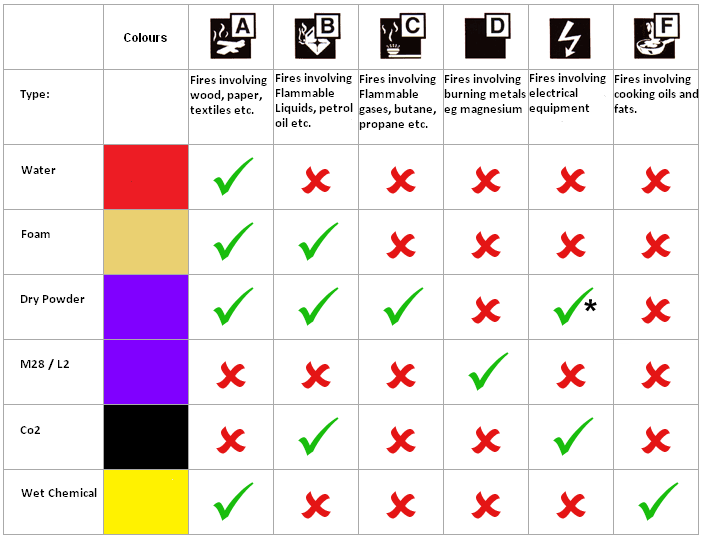 To provide you with information about which type of fire extinguisher you might need please look at the table below, all fire extinguishers have the body colour of signal red, and at least 5% of the body must be colour coded in the pre-EN3 (BS 5423) colours. There are six different types or classes of fire, each of which has extinguishers to tackle the specific types of fire. Newer fire extinguishers use a picture/labelling system to designate which types of fires they are to be used on. Additionally, the majority of fire extinguishers have a numerical rating which is based on tests conducted by professional fire-fighters that are designed to determine the extinguishing potential for each size and type of extinguisher. In the instance of class ‘A’ fires, the numerical value is the size of fire in cubic metres that the extinguisher can put out. For class ‘B’ fires the numerical value represents the amount of litres of flammable liquid that can be extinguished. Class ‘C’ fires have no numerical value as flammable gas is very difficult to measure in cubic metres – it depends on the ratio of gas to air there is in the local atmosphere. Class ‘D’ fires have a numerical value, this represents size of fire in cubic metres that the extinguisher can put out. ‘E’ Class fires have no numerical value – please remember once the source of the electricity is shut down, the electrical fire will revert to a different class. The numerical value in ‘F’ class fires is the same as in ‘B’ class fires – it represents the amount of litres of flammable liquid (cooking oils etc) that can be extinguished. Foam Fire Extinguisher Foam fire extinguishers are ideally suited where both class A & B fire risks exist. Aqueous Film Forming Foam or AFFF is particularly suited to fight liquid spill fires such as petrol, oil, fats, paints etc. and works by forming a film on the liquid to extinguish the fire. This extinguisher has also passed the electrical conductivity test at 35kv. CO2 Fire Extinguisher Carbon dioxide fire extinguishers are suitable for class B risks involving flammable liquids and especially for electrical hazards. These extinguishers have been a natural replacement for Halon. CO2 is harmless to electrical equipment and as such is ideal for modern offices, electronic risks, and fires caused by the combustion of liquids such as: oils, fats, solvents, etc. Powder Fire Extinguisher Powder fire extinguishers are especially suited to mixed fire risk environments and a good all round extinguisher. They are also suitable for flammable liquid risk, such as methane, propane, hydrogen, natural gas etc. Wet Chemical Fire Extinguishers Wet chemical extinguishers are especially designed for tackling cooking oil / deep fat fryer (Class F) fires, but also have an effective capability for extinguishing Class A fires (wood, paper, straw, textiles, coal etc.). This extinguisher has also passed the electrical conductivity test at 35kv.